The Fuerteventura Chat (Saxicola dacotiae) is a small passerine bird that was formerly classed as a member of the thrush family Turdidae, but is now more generally considered to be an Old World flycatcher, Muscicapidae. It, and similar small European species, are often called chats. It is resident and restricted to the island of Fuerteventura, one of the Canary Islands, where it is restricted to ravines and slopes with sparse, shrubby vegetation (Illera et al., 2006). 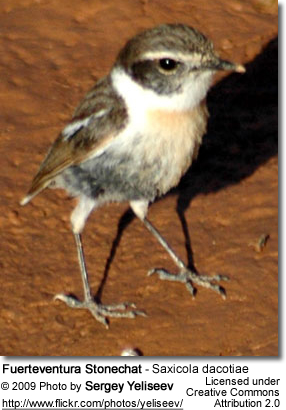 The Fuerteventura Chat is similar in size to the European Robin. Both sexes have a dark rump and tail. In summer the male has dark brownish upperparts, orange throat and black head. It has strong white neck sides and a white supercilium (line above eye). The appearance is like a cross between Whinchat and Stonechat. The female has paler brown upperparts and head, and no white neck patches. The male has a clicking call and high twittering song like a Stonechat.